Review Summary: Anushka Sharma gives it her all, in this brutal look at the rural underbelly. Realistic performances backed by a solid script make NH10 a winner! Nevertheless, on an overall basis the movie is like a petrifying journey over the rough roads of rural India. Navdeep’s less assured hands don’t lend ‘NH10’ the punch it deserves. It’s a good movie but not great. NH10 is an adventurous Bollywood film that breaks the shackles of convention and is none the worse for it. Eminently watchable. There’s not much you take home from the film except a churned tummy perhaps, but if you’re one who likes to tease your senses in the here and now, drive your way to NH10, but be warned of the sharp curves ahead. NH10 is entertaining and creepy for most parts. It’s an example for perfect casting too. This National Highway has its shares of potholes, but, it is a must visit. Do go the NH10 way! A word of caution: This one is not for the faint-hearted. The story of the movie has been thin but what brings interest is the screenplay along with a gripping narration. The music and the background score have been apt and perfect. The stunning cinematography elevates the movie and the thrilling episodes are sure worth. The production values have been grand enough and the director should be appreciated well for his narration leaving the audience on the edge of their seats. That's rare, particularly in Bollywood. And she drives her way through obstacles with amazing commitment. 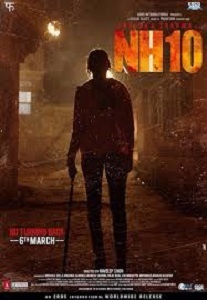 A very believable story, in the right ambiance and powerful screenplay, NH10 is going to win views more from a very strong word of mouth. However, if you are not ready to accept the harsh realities and love to live in a fantasy world where everything is picture perfect, this gruesome gripping tale is not a cup of your tea. On a whole, NH10 deals with a strong message and is showcad in quite a realistic way. Anushka’s superb performance and a thrilling narration makes this film definitely a must watch. Film will depend on exceptional word of mouth to survive.Go for this one for some great performances and tight thriller! It is time that every girl awakens a Meera within her. Watch out for Anushka’s terrific performance!